For the wrath of God is revealed from heaven against all ungodliness and unrighteousness of men, who by their unrighteousness suppress the truth (Romans 1:15-18 ESV). The typical interpretation, I think, is that the Gospel reveals God’s righteousness, and is the solution to God’s wrath which is revealed somehow “from heaven.” The idea is that God’s wrath is God’s actions of turning people over to further sin because they sin, as is vividly described in Romans 1.18ff. And yet death has not overtaken all human history. God has not sent a worldwide flood. God has not consumed the world by fire. Why not? This plainly tells us that this whole process, where God gives up sinners to more sin, was not a simply an exercise of God’s justice, but involves a work of grace. Furthermore, the “day of wrath” is not an ongoing aspect of this history, but a future date. This raises the question: Is Romans 1.18 telling us that God’s wrath is revealed in the Gospel because the Gospel tells us about this future day of wrath? They show that the work of the law is written on their hearts, while their conscience also bears witness, and their conflicting thoughts accuse or even excuse them on that day when, according to my gospel, God judges the secrets of men by Christ Jesus (Romans 2:15-16 ESV). I think this is right, but I don’t think the fact that the Gospel foretells the day of judgment is what Paul is referring to when he says that the Gospel reveals the wrath of God. How does the Gospel reveal both the righteousness of God and the wrath of God? The answer, of course, is spelled out in Romans 3.21ff. God displays both his faithfulness or righteousness and his wrath by publicly subjecting Jesus to His wrath. But now the righteousness of God has been manifested apart from the law, although the Law and the Prophets bear witness to it—the righteousness of God through the faithfulness of Jesus Christ for all who trust. For there is no distinction: for all have sinned and fall short of the glory of God, and are justified by his grace as a gift, through the redemption that is in Christ Jesus, whom God put forward as a propitiation by his blood, through [his] faithfulness. This was to show God’s righteousness, because in his divine forbearance he had passed over former sins. It was to show his righteousness at the present time, so that he might be just and the justifier of the one who belongs to the faithfulness of Jesus (Romans 3:21-26). But by putting Jesus forward as a propitiation, God has revealed his righteousness and faithfulness. He revealed his wrath on Jesus. The righteousness of God is revealed in the Gospel because the Gospel reveals the wrath of God by preaching the cross of Christ. Note that, in that last passage above, Paul is not claiming that all the unbelieving Jews are beyond the possibility of redemption. There is still time to repent. He goes on to say that only a “partial hardening has come upon Israel” (Romans 11.25). The wrath here is not the eternal wrath on unbelieving sinners at and after the day of Judgment. Rather, it is the wrath displayed on the cross. Israel’s hardening brought salvation to Jew and Gentile alike. For just as you were at one time disobedient to God but now have received mercy because of their disobedience, so they too have now been disobedient in order that by the mercy shown to you they also may now receive mercy. For God has consigned all to disobedience, that he may have mercy on all. This entry was posted in Romans on August 21, 2012 by mark. 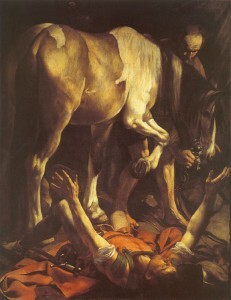 1 From Paul, a slave of Christ Jesus, called to be an apostle, set apart for the gospel of God. 4 who was appointed the Son-of-God-in-power according to the Holy Spirit by the resurrection from the dead, Jesus Christ our Lord. of faith among all the Gentiles on behalf of his name. 6 You also are among them, called to belong to Jesus Christ. All Christians are slaves of Jesus Christ, so Paul is partially setting an example in referring to himself as one. But he is also asserting his special authority since he often assures Christians that they are not slaves but sons. The point in saying he is a slave is to point out he is serving the King. C. And to raise him as a New Creation and King by the power of the Holy Spirit. A. Adam was made in the Image of God (Genesis 1.26-30). B. Being in the Image of God and being the Son of God are very closely related (Genesis 5.1-3). C. Israel was formed to be a new Adam (Compare Genesis 1.28; 8.17; to 35.11; and the terms of promise in Genesis 17.2, 6). D. The King of Israel represented and embodied the nation of Israel, and thus was a “son of God” (2 Samuel 7.14). Paul thus sets out a two-stage life for Jesus, his death and resurrection, that he will use again and again in his letter. The NET Bible I am using is correct in v. 4 to say that Jesus was “appointed the Son of God.” Versions that merely say “declare” make it sound as if the resurrection merely proved something that was already true about Jesus. But Paul is not writing about the resurrection revealing Christ’s divine Sonship, but of his being established in a new reality and office. Being a son through resurrection implies that the resurrection is a new birth. Paul will make a great deal of this idea in chapter 8. Jesus taught this view in his conflict with the Saducees (Luke 20.36), and it explains the title “Firstborn of the dead” (Colossians 1.18; Revelation 1.5) Also Peter’s first sermon claims that death, for Jesus, involved birthpangs (Acts 2.24; literal translations). Isaiah reveled this same idea when he prophesied Israel’s return from exile as a resurrection from the dead (Isaiah 26.18-19). This “good news” about a new King in a new glorified life is Paul’s Gospel. Yet it can be explained with a great deal more information–as the rest of Romans proves. If Jesus is a new King, then he should have people with whom he shares his great fortune, and whom he sends as his ambassadors. Paul has already said he is a slave and an apostleship. In verse 5 he reiterates this point, making it clear that to be take as God’s servant is to receive “grace.” And by that grace or favor, Paul has received the status of an apostle. The purpose of Paul’s calling is to take part in the Great Commission (Matthew 28.18-22). “The obedience of faith” is a term that acknowledge both that Jesus is Lord and that we are commanded to trust him. More specifically, we are to believe the message of the Gospel which tells us that Jesus is now both Lord and Christ (see Acts 2.36). The Great Commission has already been obeyed and carried out to some extent, which is why the Roman Christians are in a position to receive God’s letter. Just as Paul is called to be an Ambassador to Jesus, so they are called to belong to him. This hints at the obligation that the Romans should willingly participate in Paul’s work as an ambassador bringing about “the obedience of faith” among other nations or Gentiles. This entry was posted in Romans on August 11, 2012 by mark. Life and death are a big deal in Paul’s letter to the Romans, especially death and new life. The most obvious interpretation of the data is that humanity deserves death for sin and is granted resurrection life through Jesus by faith alone. But Paul not only speaks of death as what sinners deserves. He also speaks of death as a present state that manifests itself in ongoing sin. We sin because we are dead. And then, there is another interpretation having to do with Jesus himself: death was embraced as the path to new life for himself and all who entrust themselves to him. Death becomes pathway to life and glory. And there is also a historical scheme. All humanity was dead in sin and spiraling into judgment death, but now we have entered the age of life and glory. We are in a new and undeserved age. But all this fits together in one more way. Not only was the death in history a problem that needed to be solved, but it, itself, was part of the path to the solution–a final death of sin in the body of Christ on the cross to bring about new life. God allowed death to abound in order that life might abound all the more. This entry was posted in in the making, Romans on March 13, 2012 by mark. The law came to make sin worse. But when sin grew worse, God’s grace increased. Sin once used death to rule us, but God gave people more of his grace so that grace could rule by making people right with him. And this brings life forever through Jesus Christ our Lord. So do you think we should continue sinning so that God will give us even more grace? via Romans 5.20-6.1 NCV – The law came to make sin worse But when – Bible Gateway. Been awhile since I have engaged in self-promotion commentary on Romans, so I thought I’d point out my differences with the NCV on Romans 6.1. The goal is not “that God will give us even more grace”–as in forgive us more of our individual sins. The point is that Paul has just showed, in Romans 5, how God’s salvation and grace was brought about through a “trespass” (different word than “sin” in 5.20). By the ultimate act of unfaithfulness on Israel’s part, God granted to the world the salvation that Israel was commissioned to bring about through faithfulness. Are we to continue in sin that grace may abound? And the scope of Romans 5 is all of world history. First Adam was made and then sinned. Then Israel was given the Law to be a light to the nations to increase the trespass to the point of Adam’s original trespass in the original sanctuary. And then in the ultimate trespass, the crucifixion of Christ, God brought salvation to the world. Paul says, “NO!” in all caps. This entry was posted in Romans on December 5, 2011 by mark. Mark Horne » Blog Archive » Gentile Abraham, David, and Phinehas. In Romans 4, Paul argues from the way Abram responded to a promised reward, and the nature of the promise, in order to prove justification is by faith, not by works, so that believing Gentiles are justified by God along with believing (and only believing) Jews. Is this blessing then only for the circumcised, or also for the uncircumcised? We say that faith was counted to Abraham as righteousness. How then was it counted to him? Was it before or after he had been circumcised? It was not after, but before he was circumcised. He received the sign of circumcision as a seal of the righteousness that he had by faith while he was still uncircumcised. The purpose was to make him the father of all who believe without being circumcised, so that righteousness would be counted to them as well, and to make him the father of the circumcised who are not merely circumcised but who also walk in the footsteps of the faith that our father Abraham had before he was circumcised. So the promise itself, even though it includes a special nation marked out by circumcision, promises that Abraham will be the father of a multitude of nations. “The purpose was to make him the father of all who believe without being circumcised, so that righteousness would be counted to them as well, and to make him the father of the circumcised who are not merely circumcised but who also walk in the footsteps of the faith that our father Abraham had before he was circumcised.” This promise, is, in fact, an OT reality. Jacob hears it begin to be fulfilled when Joseph tells him that he has been made a father to Pharaoh (Genesis 45.8). The OT is filled with believing Gentiles, contrary to many Evangelical (and quasi-Marcionite) myths about the world before Christ. Paul is not satisfied with the OT benefits, however. He sees the promise as promising that eventually all nations will belong to God in the same special way as Israel so that there is no longer any distinction or special privilege among them. But I’m getting away from my main point. So like Abraham, Phinehas’ reward was very great. His act of zeal and loyalty to YHWH was counted to him as righteousness, which means, just like was true for Abraham, his descendents would be a special priestly covenant people. The whole point is that Abram the believing uncircumcised Gentile was justified just like Phinehas the faithful believing Jew. Thus, if Abraham receives the same (and really a greater) reward as Phinehas, righteousness and covenant standing for himself and his heirs, then the reason for Phinehas’ reward cannot be his Jewish works, but the faith he held in common with the uncircumcised Abram. Paul does not thoughtlessly overlook Phinehas. He argues from him, albeit silently. Just because we don’t read Numbers or the Psalms that much doesn’t mean Romans is supposed to be understandable without such knowledge. We have no business treating Paul as ignorant as we are or as accommodating such ignorant readers, and then self-righteously deciding his argument is flawed on that false assumption. This entry was posted in Romans on May 31, 2011 by mark. “Fear not, Abram, I am your shield; your wage shall be very great”? I don’t like the above translation of Genesis 15.1. It seems misleading. Now this statement occurs in the middle of a great deal of commentary on Genesis 15. It seems, frankly, to come out of nowhere. I noticed recently however that the Greek word does not have to be translated as “wages.” “Reward” is a common translation of the same Greek word. But what about the context of a discussion of Genesis 15? In my opinion, Genesis 15.1 should count as context to Romans 4.4 and affect how we translate the word. Now to the one who works, his reward is not counted as a gift but as his due. But by some weird providence, as soon as I got done listening to The Road to Serfdom I put my recording of the Romans back in the cd player and realized I was hearing about the same issues at their point of origin. Paul, a servant of Christ Jesus, called to be an apostle, set apart for the gospel of God, which he promised beforehand through his prophets in the holy Scriptures, concerning his Son, who was descended from David according to the flesh and was declared to be the Son of God in power according to the Spirit of holiness by his resurrection from the dead, Jesus Christ our Lord, through whom we have received grace and apostleship to bring about the obedience of faith for the sake of his name among all the nations… In Christ Jesus, then, I have reason to be proud of my work for God. For I will not venture to speak of anything except what Christ has accomplished through me to bring the Gentiles to obedience—by word and deed, by the power of signs and wonders, by the power of the Spirit of God—so that from Jerusalem and all the way around to Illyricum I have fulfilled the ministry of the gospel of Christ; and thus I make it my ambition to preach the gospel, not where Christ has already been named… Now to him who is able to strengthen you according to my gospel and the preaching of Jesus Christ, according to the revelation of the mystery that was kept secret for long ages but has now been disclosed and through the prophetic writings has been made known to all nations, according to the command of the eternal God, to bring about the obedience of faith— to the only wise God be glory forevermore through Jesus Christ! When you read Hayek it becomes clear that he is lamenting how history has changed directions. What should have been the flowering of Christian civilization has been traded for a bowl of red stuff. And because he himself, despite acknowledging that Christian culture happened to be involved, is not a disciple of Jesus, Hayek can’t really call anyone back to what they had. He weeps over a cut flower and pleads with it to bloom again. Hayek analyzed some elements of it and defended them, as much as a Darwinist could–but it was the Apostle Paul who gave us the international social order of peace, freedom, and prosperity. If you read The Road to Serfdom and then read Paul’s letter to the Romans, this basic truth will become forcefully apparent. YouTube – “Fear the Boom and Bust” a Hayek vs. Keynes Rap Anthem. YouTube – Fight of the Century: Keynes vs. Hayek Round Two. This entry was posted in political-economy, Romans on May 28, 2011 by mark. Propitiation is in the Gospel after all…. But now my reading of Romans 1.16-3.27 leads me to understand that Paul insists that the Gospel reveals God’s wrath, as part of revealing his righteousness. And it reveals God’s wrath by revealing how it was all put upon Jesus on the cross. This entry was posted in Romans on May 21, 2011 by mark. Was there an act of unfaithfulness related to the propitiation that Jesus provided? For I am not ashamed of the gospel, for it is the power of God for salvation to everyone who believes, to the Jew first and also to the Greek. For in it the righteousness of God is revealed from faith for faith, as it is written, “The righteous shall live by faith.” For [in it] the wrath of God is revealed from heaven against all ungodliness and unrighteousness of men, who by their unrighteousness suppress the truth…. Note that I am now reading the passage so that the wrath is not something revealed somewhere or somehow else, to be answered by the Gospel, but it revealed also in the Gospel itself. But if our unrighteousness serves to show God’s righteousness, what shall we say? That God is unrighteous to inflict wrath on us? (I speak in a human way.) By no means! For then how could God judge the world? But if through my lie God’s truth abounds to his glory, why am I still being condemned as a sinner? And why not do evil that good may come?—as some people slanderously charge us with saying. Their condemnation is just. But now the God’s righteousness has been manifested apart from the law, although the Law and the Prophets bear witness to it— the righteousness of God through the faithfulness of Jesus Christ for all who believe. For there is no distinction: for all have sinned and fall short of the glory of God, and are justified by his grace as a gift, through the redemption that is in Christ Jesus, whom God put forward as a propitiation by his blood, through faithfulness. This was to show God’s righteousness, because in his divine forbearance he had passed over former sins. It was to show his righteousness at the present time, so that he might be just and the justifier of the one who is of the faithfulness of Jesus. So think real hard: Was the death of Jesus somehow associated with the unfaithfulness of Israel so that both could be said together to show God’s righteousness? And then what about other passages–are these unrelated? And the free gift is not like the result of that one man’s sin. For the judgment following one trespass brought condemnation, but the free gift following many trespasses brought justification… Now the law came in to increase the trespass, but where sin increased, grace abounded all the more, so that, as sin reigned in death, grace also might reign through righteousness leading to eternal life through Jesus Christ our Lord. What shall we say then? Are we to continue in sin that grace may abound? What shall we say then? Is there injustice on God’s part? By no means! For he says to Moses, “I will have mercy on whom I have mercy, and I will have compassion on whom I have compassion.” So then it depends not on human will or exertion, but on God, who has mercy. For the Scripture says to Pharaoh, “For this very purpose I have raised you up, that I might show my power in you, and that my name might be proclaimed in all the earth.” So then he has mercy on whomever he wills, and he hardens whomever he wills. You will say to me then, “Why does he still find fault? For who can resist his will?” But who are you, O man, to answer back to God? Will what is molded say to its molder, “Why have you made me like this?” Has the potter no right over the clay, to make out of the same lump one vessel for honorable use and another for dishonorable use? What if God, desiring to show his wrath and to make known his power, has endured with much patience vessels of wrath prepared for destruction, in order to make known the riches of his glory for vessels of mercy, which he has prepared beforehand for glory— even us whom he has called, not from the Jews only but also from the Gentiles? So I ask, did they stumble in order that they might fall? By no means! Rather through their trespass salvation has come to the Gentiles, so as to make Israel jealous. Now if their trespass means riches for the world, and if their failure means riches for the Gentiles, how much more will their full inclusion mean! Now I am speaking to you Gentiles. Inasmuch then as I am an apostle to the Gentiles, I magnify my ministry in order somehow to make my fellow Jews jealous, and thus save some of them. For if their rejection means the reconciliation of the world, what will their acceptance mean but life from the dead? Make sense? And yes, I’m wondering if God wanted to “show his wrath and make known his power” in the cross of Christ. Despite being “vessels of wrath prepared for destruction” Paul clearly states that their hardening was “partial,” meaning temporary. While some were indeed hardened in the way we Calvinists think of (for else how could God judge the world?–as Paul asked earlier) the statement seems primarily directed to God’s putting forward of Jesus as a propitiation. Thus, the humbly named “Horne thesis on Romans” in a nutshell. I thank my God through Jesus Christ for all of you, because your faith is proclaimed in all the world. Do not, for the sake of food, destroy the work of God. Everything is indeed clean, but it is wrong for anyone to make another stumble by what he eats. It is good not to eat meat or drink wine or do anything that causes your brother to stumble. The faith that you have, keep between yourself and God. Blessed is the one who has no reason to pass judgment on himself for what he approves. The faith of the Church can only be proclaimed in one voice if the faith of the members knows limits set by love. This entry was posted in Romans on May 15, 2011 by mark.